Invite a fellow entrepreneur to Yoco and we’ll give you R500 for everyone that signs up and transacts. 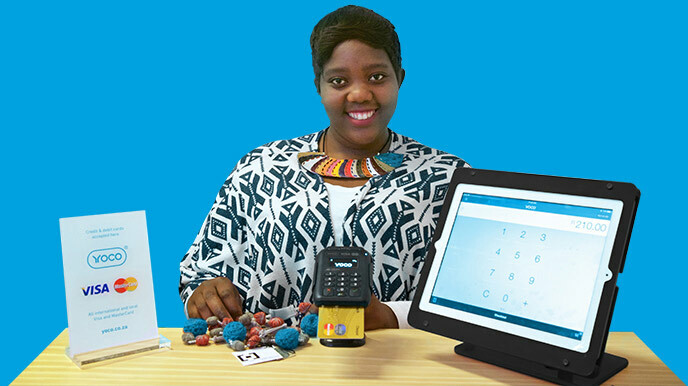 We’ll also give them R250 off the price of their card machine to get them started. Share your code via Facebook, Twitter, Email or copy to clipboard. Make sure your friend has entered your code when they sign up. Once your friend has been settled for the first time you will receive your R500 into your bank account. 1. How does the referral program work? 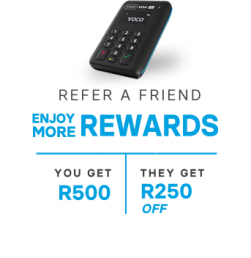 • You will get R500 cash back for referring friends to Yoco. • This will be paid out into the bank account you have supplied us when you signed up for Yoco. • Your friend will get a R250 discount off their order by signing up with your referral code. • During sign up there is a “promo code” field. Please note the friend you referred must enter your referral code into the promo code field when signing up in order to qualify. 2. Where can I find and share my code? • Log in to your Yoco Business Portal using the email address and password you signed up with. • Click on the green "Claim my R500" button in the top right corner. Here you will see your referral code which you can send to your friends via email, Facebook, Twitter or copy it and send it how you like. • Please note our referral program and incentive is intended to help your networks get set up on Yoco, and not to be used for active reselling. Our T's and C's advise against sharing this on any Yoco specific content such as Yoco posts or ads online. You are still welcome to share this on your personal pages and profiles. 3. When will I get my reward? • You will receive your reward when the business you referred has transacted and been settled their money for their first transaction. 4. My friend did not receive their discount, why? • Did they type the code in correctly? • Did they complete their Yoco signup? • Did they enter the code in the correct field when signing up? • If yes to all of the above, please ask them to email us on referrals@yoco.com and we will be happy to help. 5. I did not receive my reward, why? • Did your friend type the code in correctly? • Did your friend enter the code in the correct field when signing up? • Did your friend complete their Yoco signup and are officially a merchant with us? • Did your friend transact and have they been settled their funds for the first time? • If yes to all of the above, please email us on referrals@yoco.com and we will be happy to help. 6. How many people can I refer? • There is no limit to the number of people that you can refer. 7. How can I personalize my referral code? • Please email us on referrals@yoco.com if you would like a personalized code. 8. What if there is already a Yoco promotion? • If Yoco is running a discount that does not require a promo code to be entered, your friend can still enter your referral code and you will be rewarded. Your friend will receive the larger of the two discounts between the current promotion and the referral discount.